When it comes to mortgage rates, everyone is looking for the lowest one. 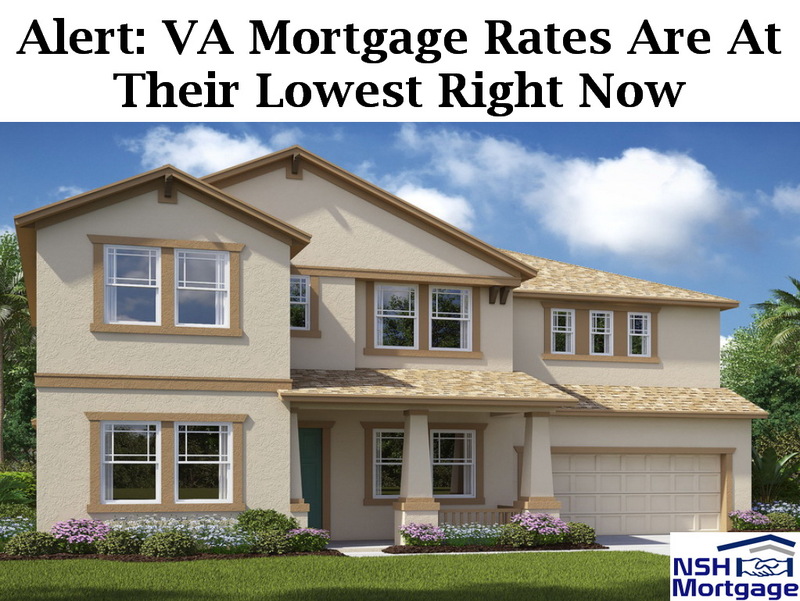 VA mortgage rates are at their lowest for eligible service members and veterans. In fact, NSH Mortgage has the wisdom and tools to help you out with your VA mortgage rates. Mortgage shoppers wait for the right day to lock to save a fraction of a percentage point on their rate. But many mortgage consumers overlook something about themselves that can reduce their rate much more than a well timed lock their U.S. military status. Veterans and active duty members of the U.S. armed forces are eligible for the lowest rates compared to FHA loan and conventional loan applicants. Current and former military personnel should not bypass a VA loan quote, even if they think they have negotiated a very low rate for another loan type. Loan applicants are surprised at these results. After being told that Veterans Administration home loans were high risk of low quality products and many veterans assume they came with high rates, too. But applicants soon discover that all this is untrue. In addition, these myths are keeping veterans from taking advantage of this benefit. In fact, of the 20 million veterans alive today, only about 7% of them have purchased a home with a VA loan in the past five years. But veterans rarely go back to any other loan type once they have used a VA home loan. In fact, these advantages are too great to pass up. Another VA loan myth is that they are a major headache. There is onerous paperwork, say critics, plus you have to deal with the Veterans Administration neither of those claims hold water. The paperwork is no more involved than for any other loan type. Yes, there are a few more documents to gather, such as your DD-214 and your 26-1880 (request for COE). But these items are no harder to gather than a W2 or pay stub. Additionally, VA loans are not processed by the Department of Veterans Affairs. They are different from most other VA benefits. The VA approves private lenders to issue these loans, then backs the loans to make sure lenders keep rates low. Lower rates than any other loan type. Help from the VA if you have trouble making payments. The list goes on. The point is, a veteran should almost never choose a loan other than VA without at least examining this option. They will probably find that there are too many perks to pass up. It is a mystery why veterans end up with non-VA loans. A VA mortgage would likely lead to a lower payment when not making a large down payment. A VA mortgage would likely lead to a lower payment. That is especially true when the veteran has no money to put down or has less than perfect credit. One major problem is the lack of knowledge about VA loans among loan officers. Did you know that the loan officer, the specific individual working on your loan, is more important than the company itself when it comes to providing you the best options? The company might be great, but companies cannot possibly train every loan officer to ask every question that needs to be asked, or present only the best loan solutions to the applicant. That only comes with experience. That is why the first question you should ask your loan officer is, How many VA loans do you do per month? If the answer is zero, politely turn and walk away. This is not someone you want presenting your options. Many eligible veterans end with high cost FHA loans or conventional loans with mortgage insurance, because their loan officer did not know about VA loans, or simply did not want to take the time to learn. It is often more expedient for them to close the deal quickly via a program they understand. That is not in the veteran’s best interests. It is fine if a friend or relative refers you to a certain loan expert, but you still need to do your homework. Verify the loan officer’s experience, and make sure he or she shows you the VA loan option alongside others. If the loan officer tries immediately to talk you out of a VA loan, that is almost certainly a reason to walk. There could be valid reasons not to take a VA loan. For instance, if you are putting 20% down and have great credit, a conventional loan might be better. Then, you do not pay the 2.15% VA loan funding fee, and there is no mortgage insurance. But most new and experienced home buyers do not want to put 20% down, or have better uses for that money. In almost every case, eligible veterans should at least review their VA loan scenario. The following is a comparison of a buyer with a 680 credit score purchasing a $250,000 home with three major loan types. Imagine if an eligible veteran passed up the chance to get a VA loan. They would pay thousands upfront, and end with a higher monthly payment, too. There is almost never a reason to bypass the huge advantages a VA loan affords.